Quantum physics have given us transistors, lasers and the Internet. What’s the next big thing? Quantum computers. 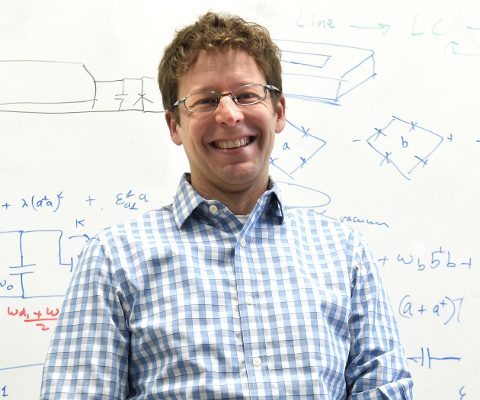 Dr. Alexandre Blais and a team of physicists and engineers at the University of Sherbrooke are looking at the next generation of information technology. Quantum computers can do extremely complex calculations very quickly, such as decoding encryption codes. Dr. Blais and his team are working with companies like Google, Microsoft and IBM to be the next industry pioneers. This important work received funding from the Canada First Research Excellence Fund. * Alexandre Blais was one of 14 Innovators to Know invited to Ottawa by Universities Canada on Feb. 24, 2016 to meet with high school students, science policy makers and Parliamentarians.